Rinse chicken and pat dry. Heat oil in a 10- to 12-inch frying pan over medium-high heat. Add chicken and cook until browned on both sides - approximately 6 minutes total. In a small bowl, combine apricot jam and mustard. Spread jam mixture over the browned chicken breasts and sprinkle with frozen blueberries. Reduce heat to medium-low, cover the pan and simmer until the thickest part of the meat is no longer pink - approximately 15 minutes. 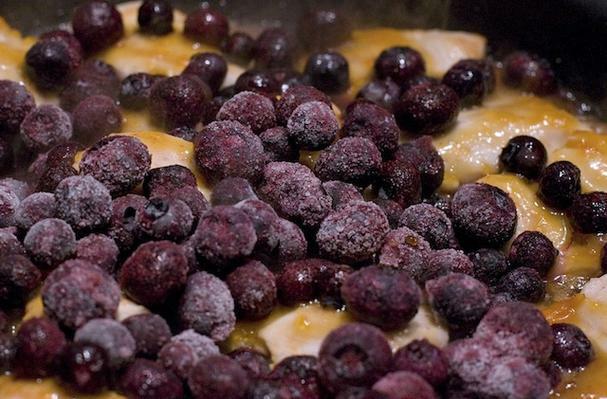 With a slotted spoon, remove chicken and blueberries to a platter and keep warm. Add vinegar to the pan, increase heat and bring the mixture to a boil. Cook, stirring occasionally, until the sauce has thickened and reduced by 1/3 - approximately 5 minutes. Pour sauce over chicken and blueberries. Garnish with watercress or arugula.